Deeply devotional invocations improvised by Ram Krishna Das, a very learned singer of Indian ragas. Accompaniment by world-class instrumentalist John Wubbenhorst. These songs arose in celebration of the Great Sovereign-Avataric Holy Month of Da Jayanthi 2009 (the celebration of the “Victory” of Avatar Adi Da’s physical Lifetime). November 3, 2009, marked the seventieth anniversary of the Divine Birth of Parama-Sapta-Na Adi Da Samraj. And that year the Holy Month fell within the one-year period of vigil following His Divine Mahasamadhi (Passing) on November 27, 2008. Hundreds of devotees, friends, and family from around the world gathered on Naitauba, Avatar Adi Da’s hermitage in Fiji, for this poignant month-long celebration and tribute. Ram Krishna Das was among those who traveled to Naitauba, along with fellow musician (and longtime devotee of Avatar Adi Da) John Wubbenhorst. Together they offered musical gifts to Adi Da Samraj. With Ram improvising vocals and John accompanying on bansuri and keyboard, they provided a devotional depth through sacred music for all present. Many who attended these musical offerings were so heart-moved by the devotional quality they requested a recording of these sessions. Fortunately a few of the recordings came out well. With this CD, now you too can participate in this sacred music and perhaps even the devotional mood of the Da Jayanthi Celebration! For each occasion, the musicians chose a raga to start the improvisation. 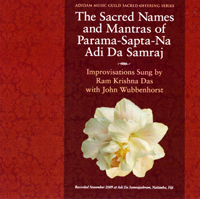 Then Ram sang a selection of the Names and twenty-three Mantras of Parama-Sapta-Na Adi Da Samraj. Raga Hamsadwani and Raga Bhupali: Both are known in Indian culture as among the sweetest of ragas. Many folk tunes have used modes from them. Raga Bhairavi: One of the most cherished ragas of India. This one is often saved for the end of a musical event because of the extreme devotional mood it evokes in listeners—many feel that afterward there’s nothing more that can be heard!